Can I tell you one of the top things on my bucket list to accomplish? I wanted to buy our Texas family cowboy boots…I mean seriously, they live in the BIG state. Of course, who should be on the top of the list?…Little Man! Lord have mercy, look how cute these boots are? The capture as he is walking passed a mirror in Cavenders Boot Shoppe. Can you imagine what is going through his little mind? Well, cowboy boot shopping is VERY tiring…the journey home. Little Man looks good in any ‘uniform’! He is too adorable! He looks very proud to be wearing those boots. Oh now, that’s darling! Being Texas born myself, I can attest to the need of owning a pair of cowboy boots. It’s a necessity if you’re going to call yourself a Texan, or in my case a New Texican (Texan/New Mexican). Oh, my goodness! 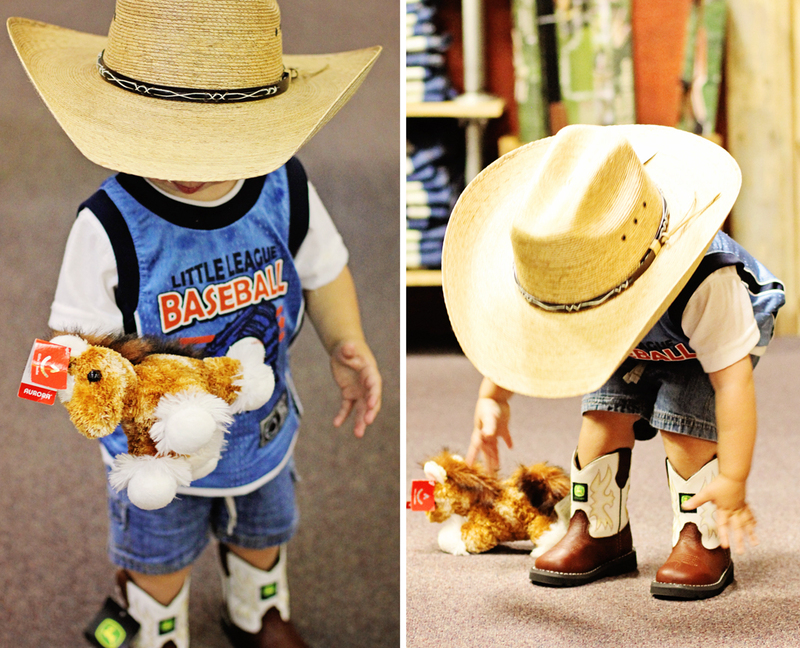 This little one with his cowboy boots is just too cute. Beautiful shots — lovely memories. I do believe this wins the cuteness award for the day! Completely adorable. 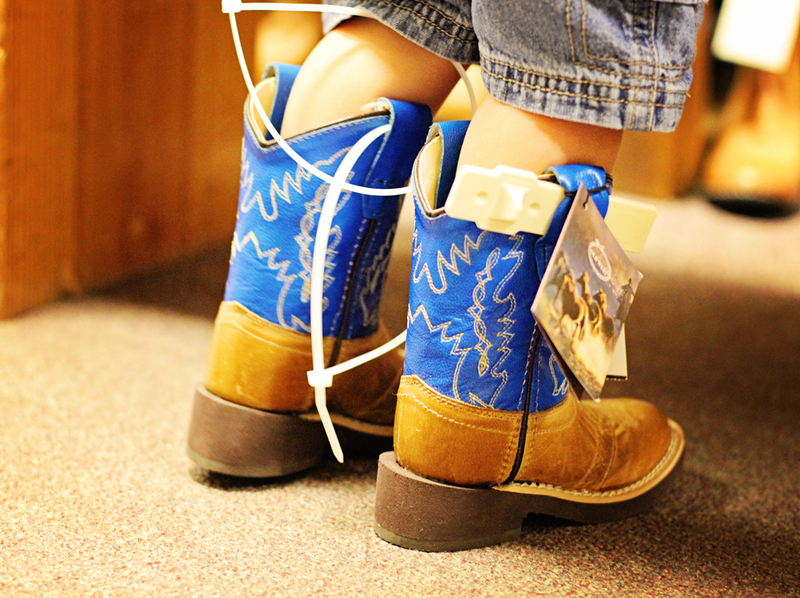 Every little boy should have a pair of cowboy boots! Laurie, it is so good to be back viewing a few blogs! 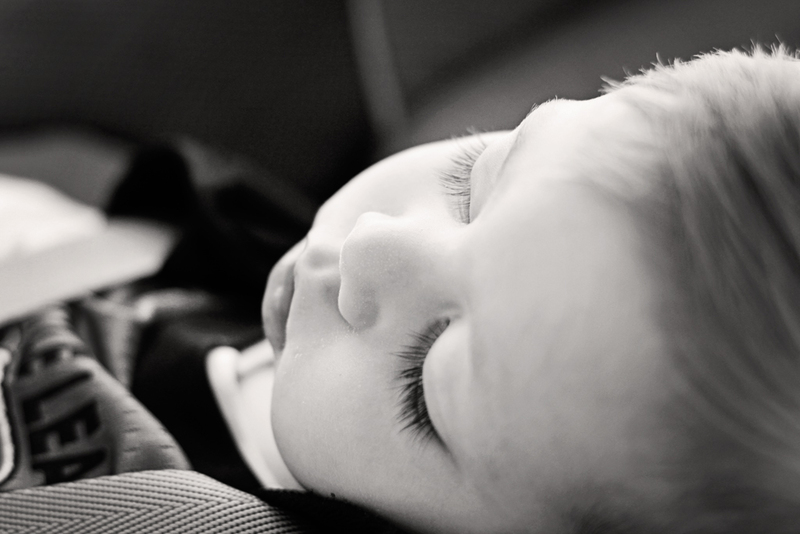 That photo of Little Man sleeping is nothing short of beautiful, and I love the one of him looking in the mirror too. Since I am so behind on looking at blogs, let me know if there is a favorite of yours that I have missed since the accident. Well I am glad to see you are back here…get better my friend! Good grief! Is he adorable in that hat and boots, or what? He is the cutest little cowboy ever! Great captures of him. Well, ain’t that the cutest??!! But he has to wait until Christmas?? Oh lord – he is just too cute, isn’t he? Oh, that pic of him checking himself out in the mirror is priceless! OMG lil man is just too adorable for words and to see his expression in that mirror – PRICELESS! I just love little boys’ shoes … and boots are even better! Ah Laurie what a dream little guy he is ! Look at him tipping his hat in the mirror 🙂 and those cowboy boots … just terrific !!! Your camera does “Little Man” such justice. I swear, he is the embodiment of child beauty. The skin–the lashes–the expressions and utter unawareness of self. I think that’s what most appealing about children. They are so natural! somewhere–maybe high school?–we all become so affected. Well…a lot of us. I could see a whole series of still life photos on those boots! Cute cute and cute on top of cute! Ahh…couldn’t you just eat him with a spoon? Those boots are to die for and that cowboy hat….he’s just so precious…. How cute is that! I too want some.e cowboy boots, they make such neat ones anymore! Sweet dreams “Little Man”! oh my god I can’t stand it! Too cute for words! I am so amazed by his action in front of the mirror. Cute boy ! Based on well he wears them, I have a feeling this is the first pair of MANY in his life! LOL! I love the boots. He really looks like he will enjoy them. Soo c u t e! And I agree completely; buying shoes is exhausting. The mirror picture is so precious! He is the cutest!! Love y’all. We don’t have any boots either I think boot shopping is necessary! This is just the cutest! 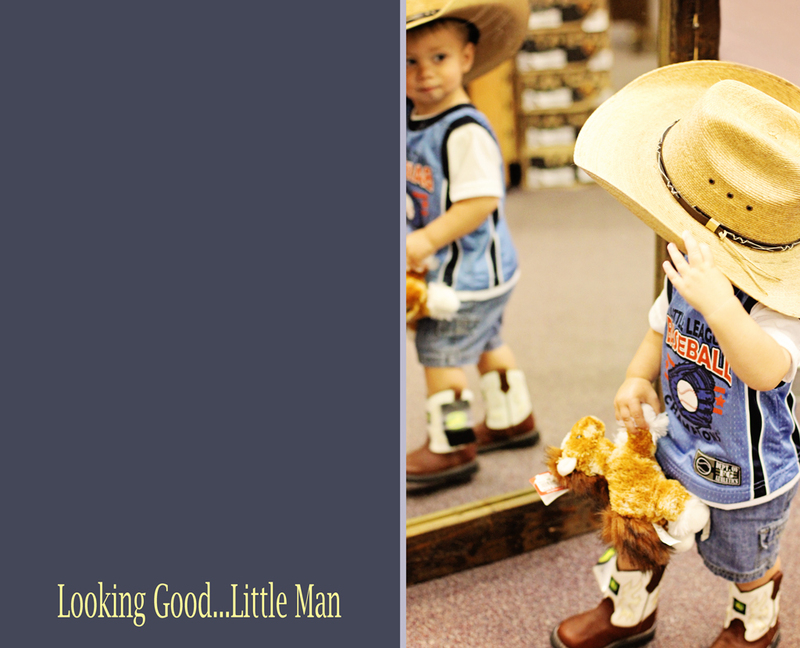 Really like the one where he is looking in the mirrorr and tapping his cowboy hat ….. just like a little gentleman! Cute! You got to love those little boots and the look on his face! So adorable. I like the picture that he looks at himself in the mirror. Love how he does that. That picture just makes me smile! Thank you for your kind words…Happy Wednesday.